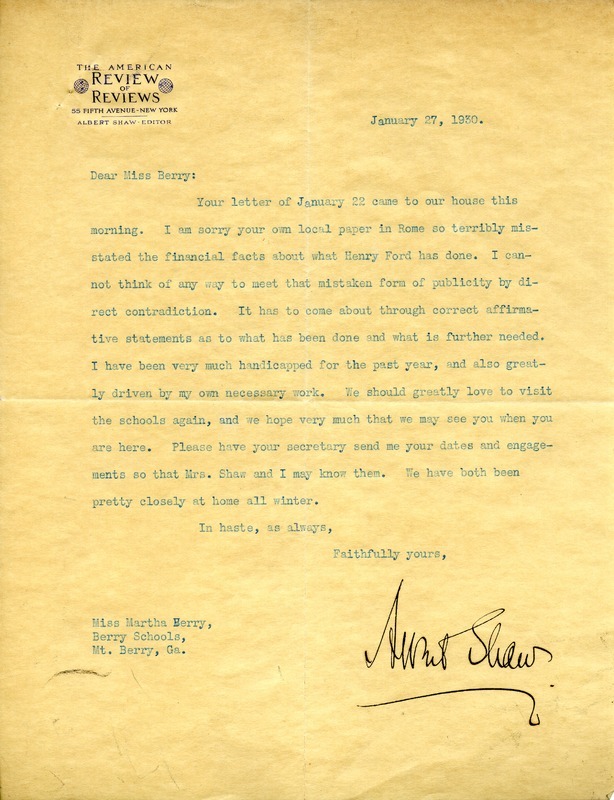 Shaw commiserates with Berry about the misrepresentation of Henry Ford's support of the schools, telling her that only correct affirmation of the facts can contradict the effects of the misinformation. He and Mrs. Shaw hope to be able to visit soon. Albert Shaw, “Letter to Martha Berry from Albert Shaw.” Martha Berry Digital Archive. Eds. Schlitz, Stephanie A., Jordan Brannen, Sherre Harrington, et al. Mount Berry: Berry College, 2014. accessed April 24, 2019, https://mbda.berry.edu/items/show/13989.